Elevated BP is often unrecognized due to several factors including lack of acute symptomatology until it is significantly elevated, suboptimal BP measurement techniques, and previously complicated childhood normative BP data. Even in those diagnosed with hypertension, treatment rates are low,2 likely also related to the relatively silent symptomatology as well as the lack of understanding of the potential long-term outcomes associated with years of uncontrolled hypertension. 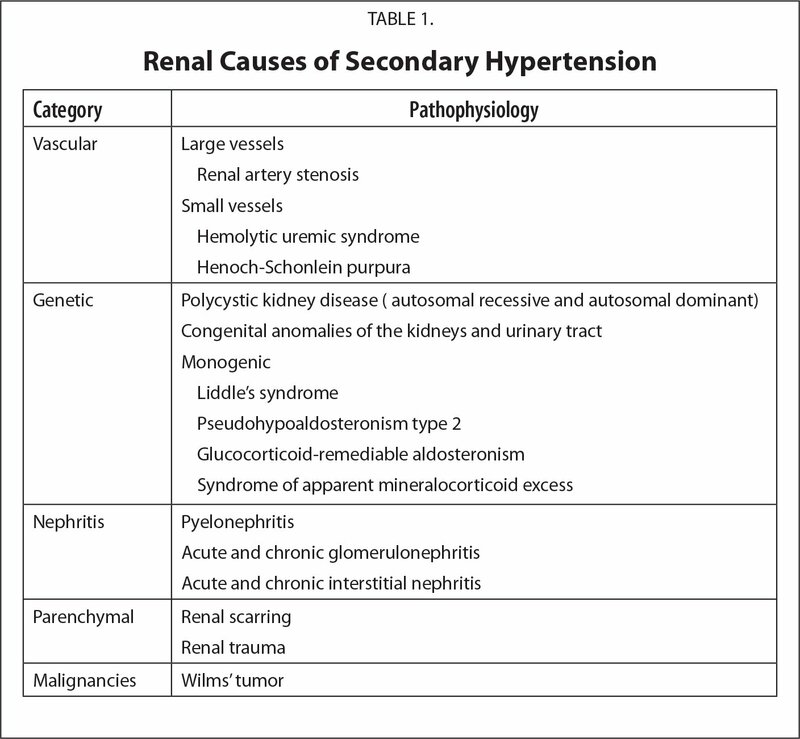 Kidney disorders are the most common cause of secondary hypertension, accounting for 34% to 79% of cases.8 There should be a high index of suspicion for kidney disease in children younger than age 6 years with hypertension.9 Renal conditions causing hypertension are described in Table 1. Coarctation of the aorta is another known secondary cause of hypertension. Higher BP on the right upper extremity when compared to the lower extremity BP is the clinical hallmark, and an echocardiogram would be used for confirmation.10 Patients with coarctation of the aorta are at increased risk of hypertension before repair, immediately after repair, and later in life.11,12 Masked hypertension can also be present after repair, and an ambulatory BP monitor may aid in the diagnosis. Once the diagnosis of hypertension has been confirmed, the evaluation should differentiate between primary and secondary hypertension as well as identify comorbidities. The CPG3 recommends that children diagnosed with hypertension have tests for serum blood urea nitrogen, creatinine, routine electrolytes, and urinalysis performed. Additionally, the guidelines suggest that a renal ultrasound be obtained if patients are younger than age 6 years or presenting with an abnormality in one of the above parameters. Further assessment should be guided based on comorbidities. Evaluation for children and adolescents who are obese should include a fasting lipid profile, liver function tests, and hemoglobin A1c. Fasting serum glucose, thyroid-stimulating hormone, drug screen, and a sleep study can be considered based on history. If there is a higher suspicion for secondary causes of hypertension, more extensive testing should be performed tailored to the specific signs and symptoms or laboratory abnormalities of concern. Lifestyle modifications should always be a primary intervention to treat elevated blood pressure, which includes17 (1) dietary: primarily by reducing dietary sodium. The Dietary Approach to Stop Hypertension consists of large amounts of fruit and vegetables, low-fat milk products, whole grains, fish, poultry, nuts, lean red meats, and limited sugar intake; (2) physical activity: 40 minutes of moderate to vigorous aerobic physical activity, at least 3 to 5 days per week improved systolic BP by an average of 6.6 mm Hg;18 (3) weight loss if overweight; (4) correction/treatment of comorbidities (such as hyperlipidemia, obstructive sleep apnea); and (5) stress reduction. Failure to improve BP despite lifestyle modifications in stage 1 hypertension or stage 2 hypertension, evidence of end-organ damage, and hypertension in the setting of diabetes or chronic kidney disease (CKD) are indications for treatment with pharmacologic agents.3 Lifestyle modifications should continue while pharmacologic treatments are started. Common first-line agents include angiotensin converting enzyme (ACE) inhibitors, long-acting calcium channel blockers, and angiotensin receptor blockers.19,20 In patients with diabetes, CKD, or left ventricular hypertrophy, ACE inhibitors/angiotensin receptor blockers would be the preferred choice. Adolescents of childbearing age should be informed of the teratogenic effects of ACE inhibitors and angiotensin receptor blockers, and other agents may be preferred for these patients. Various mechanisms may play a role in the increased prevalence of hypertension in the obese child or adolescent. Hyperinsulinemia is one of the proposed mechanisms that play a causal role in obesity-associated hypertension.21 Elevated BP and abnormal glucose tolerance are 2 of 5 criteria for the definition of metabolic syndrome.22 When insulin resistance develops, there is compensatory hyperinsulinemia to achieve glucose control. Insulin activates the sympathetic nervous system, thereby increasing blood pressure. Hyperinsulinemia has also been shown to upregulate renal tubular sodium transport (increased sodium reabsorption in the distal tubule). An epidemiologic study by Yang et al.23 showed that the population was twice as likely to develop hypertension with a higher sodium intake, but participants who were overweight/obese had even higher odds (odds ratio 3.5) of developing hypertension with higher salt intake. Left ventricular hypertrophy is the most common target organ damage. Daniels et al.31 found that 38.5% of teens with BP >90th percentile had left ventricular mass >95th percentile. It is imperative that hypertension in children and adolescents be appropriately recognized and managed, since there are important implications for future cardiovascular health. Although there are challenges in the measurement, diagnosis, and management of hypertension in children, the new guidelines provide the practitioner with some practical ways to overcome them. With the expected increasing trend in obesity rates, the issue of hypertension will also increase. Ongoing awareness and education are necessary to best care for this population of patients. Whelton PK, Carey RM, Aranow WS, et al. 2017 ACC/AHA/AAPA/ABC/ACPM/AGS/APhA/ASH/ASPC/NMA/PCNA guideline for the prevention, detection, evaluation, and management of high blood pressure in adults: executive summary: a report of the American College of Cardiology/American Heart Association Task Force on Clinical Practice Guidelines. Circulation. 2018;138(17):e426–e483. doi:10.1161/CIR.0000000000000597 [CrossRef]. Torrance B, McGuire KA, Lewanczuk R, McGavock J. Overweight, physical activity and high blood pressure in children: a review of the literature. Vasc Health Risk Manag. 2007;3(1):139–149. Debora Matossian, MD, MS, is an Attending Physician, Division of Kidney Diseases, Ann & Robert H. Lurie Children's Hospital of Chicago; and an Assistant Professor of Pediatrics, Northwestern University Feinberg School of Medicine. Address correspondence to Debora Matossian, MD, MS, Division of Kidney Diseases, Ann & Robert H. Lurie Children's Hospital of Chicago, 225 E. Chicago Avenue, Box 37, Chicago IL, 60611; email: dmatossian@luriechildrens.org.